Albina for Protected Crops, is a pioneering new product that increases fruit-setting and reduces physiological disorders. Albina works by helping fruit absorb calcium, a nutrient that can improve quality but is poorly absorbed by fruit. Albina uses Levity’s pioneering chemistry, to stimulate calcium absorption where conventional products cannot. It will help improve flower set in all crops, reduce blossom end rot in tomatoes, peppers and eggplants, and reduce fruit abortion in cucumbers to higher standards using very low inputs. Key Benefits: Increased flower set, fruit-set, reduced physiological disorders and improved growth during stress. Lono for Protected Crops is a smart fertiliser that focuses the plants growth on fruit, by supplying nitrogen in a form that encourages reproductive growth. Lono uses Levity’s LimiN chemistry to hold nitrogen in the amine form, and also contains calcium or potassium. Applied in low doses through the season Lono lifts flowering, fruit numbers and improves grading and quality and extends the picking season. Lono helps crops maintain growth during periods of stress, safeguarding yield. Key benefits: Increased flowering, fruit number, improved quality, more even size distribution, and improved growth during stress. Sulis for Protected Crops builds maturity (colour and brix) in tomato, pepper, aubergine, melon and other protected fruit and vegetable crops. Sulis works by supplying molybdenum and boron in a special formulation that helps the fruit maximize the function of the processes responsible for the maturation process, building better levels of colour and brix to allow earlier picking. The chemistry in Sulis uses these nutrients alongside natural chemistry developed by Levity’s team of crop scientists, that actively encourage the functioning of the plants natural process of maturity, whilst ensuring these key nutrients in the process are available. Sulis also contains cell wall stabilisers, so that whilst colour and sugars build the developing fruit can also maintain firmness. Normally there is a trade off between colour and sugar formation and softening, Sulis is designed to manage this process so that farmers can get the taste they need whilst still picking fruit that’s firm. Key Benefits: Improved colour formation, improved brix levels, better fruit firmness. 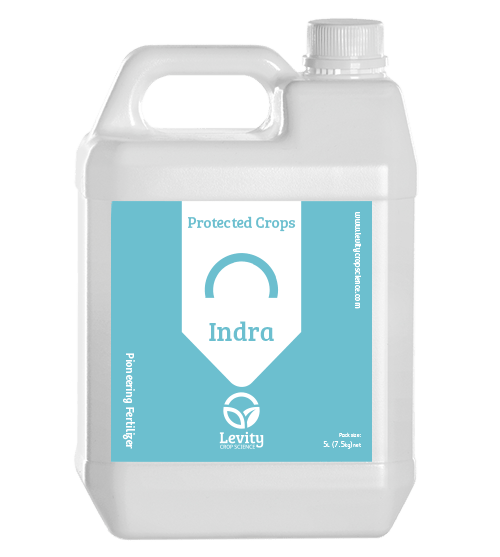 Indra for Protected Crops is a product that improves growth and quality of tomato, pepper, cucumber, eggplant, melons and other protected crops by helping them cope with stress caused by heat, cold, salinity, drought, and high UV light. Stress causes crops to produce toxins (ROS) that damage cells, and reduce quality. Indra promotes the plants own antioxidant production, and supplies the nutrients needed to make their manufacture possible. Indra can help protect crops from yield and quality lost due to high EC irrigation water or periods of drought. Key benefits: Protects crops from heat, cold, high EC water, UV and drought, helping prevent loss of quality and yield during poor growing conditions. Application Rates: 1 l/ha at 14 day intervals during periods of stress.